An arranged marriage is a marriage that is arranged by someone other than the persons getting married. Arranged marriages happen in the Middle East, parts of Africa and in Asia. The purpose of such marriages is to form a new family unit while respecting the chastity of everyone involved. Sometimes the term is also used when match making is done by agents, priests or religious leaders. Until 20 years ago the Indian middle class was almost non existent. There were hardly any opportunities for business and finding jobs was difficult. During these times, parents took responsibility to ensure better education and support their children financially with all their lifetime savings. The “Arranged marriage system” contributed in ensuring that all members of a family lived together, thereby minimizing expenses of running multiple households. Arranged marriages offer protection and security to women. As parents decide the family, they make use of maturity while choosing suitable spouses for their children. Arranged marriages place far more emphasis on integrity, diligence, humility and generosity. People get married based on practical reasons, and work on building affection later. Strong characteristics like the ones described above are very conducive to building love and affection in Indian marriages. As a result, these marriages are much longer-lasting than many Western marriages. The primary emphasis of Arranged Marriages is not on physical beauty. In this system the spouses get to know one another on a practical level first, looking beyond trivial issues such as physical appearance. The system ensures consolidation of family property, heritage and preservation of culture. The primary emphasis for a female’s parents is to ensure a secure social and financial future for their daughters. They look for a family where their daughter would go through a minimal adjustment process to assimilate into her new household. India is are already witnessing a change where today’s generation prefers to live in nuclear families rather than joint families. 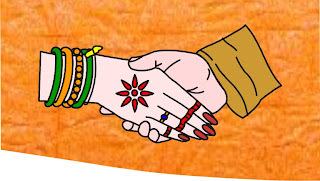 The new generation does not like the interference and social pressures that accompany the "Arranged Marriage System".As India grows and breaks the old shackles of tradition, the relevance of the Arranged Marriage System will be reduced. Plane Wedding Indian Culture would hope that your criteria for a marriage partner were deeper than her relationship with her Partner.Who is that person fell in love with? What are his or her values? Are they compatible with my own? The woman rules the household de-facto, without screaming for authority. The man is the head of the household , but the real power lies with the woman. And women in those cultures know how to command that power without screaming in her life with life partnar. We are Suggested You wedding planning in india and make enjoyful life in beach wedding anywhere in india.Wedding Planner India is the professional who plans your marriage in a unique and grand style. They give you memorable and unforgettable moments. Go Heritage India Journeys offers high guaranteed discount on Wedding Planner India.